Bacon, Cheddar, and Apples make a great combo for brunch, lunch or even supper. This recipe is very easy to prepare. I especially appreciate that it can be assembled the night before and refrigerated overnight. I made it for a football tailgate and everyone rated it "a touchdown." The combination of flavors is mouthwatering. Grease 2-quart casserole. In 10-inch skillet, melt butter over medium heat. Cook apples in butter 2 to 3 minutes, stirring occasionally, until crisp-tender. Stir in brown sugar; reduce heat to low. Cook 5 to 6 minutes, stirring occasionally, until apples are tender. 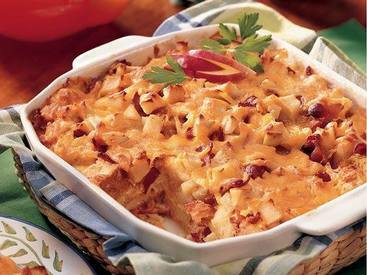 Layer half each of the bread, bacon, apples and cheese in casserole. Repeat with remaining bread, bacon, apples and cheese. Mix all remaining ingredients; pour over cheese. Cover tightly and refrigerate at least 2 hours but no longer than 24 hours. Heat oven to 350ºF. Bake uncovered 40 to 45 minutes or until knife inserted in center comes out clean.